This show was pre-recorded on Wednesday March 13, 2019, and aired on Thursday March 14, 2019 on PhillyCAM’s radio station WPPM 106.5 FM in Philadelphia. Hear the audio on PhillyCAM’s podcast site on Soundcloud. The script is below. Hello and welcome to Philly Talks Climate — where we talk about the climate crisis, how it affects Philadelphia, and how we solve this for our region. I’m Meenal Raval, and I’ll be your host. It all started in August of 2018 after seeing heat waves and wildfires in Sweden. A teenager decided to sit outside government buildings instead of going to school, with a sign School Strike For Climate. Her demands? That the Swedish government reduce emissions as per the Paris agreement. After a few weeks of daily strikes, Greta announced she would continue striking until Sweden aligns with the Paris agreement, but only on Fridays. She continues to strike on Fridays to this day. By November, students in other European cities joined Greta in demanding climate action, with their own Fridays for Future rallies. This spread to Australia. And by December, there were School Strikes for Climate in over 270 cities across the globe. By mid-January of this year, at least 45,000 students protested in Switzerland and Germany. By mid-February, 224 academics in the UK signed an open letter giving their full support to the striking students. This past week 700 German researchers supported the school strikes in their country. Yesterday in Germany, 12,000 scientists have signed a support statement for Fridays for Future! These include many prominent climate experts, including directors of the main climate research institutes. We, the young, are deeply concerned about our future. […] We are the voiceless future of humanity. We will no longer accept this injustice. […] We finally need to treat the climate crisis as a crisis. It is the biggest threat in human history and we will not accept the world’s decision-makers’ inaction that threatens our entire civilisation. […] Climate change is already happening. People did die, are dying and will die because of it, but we can and will stop this madness. […] United we will rise until we see climate justice. We demand the world’s decision-makers take responsibility and solve this crisis. You have failed us in the past. If you continue failing us in the future, we, the young people, will make change happen by ourselves. The youth of this world has started to move and we will not rest again. The biggest global strike is scheduled in two days, for Friday March 15th, with about 1325 places in 98 countries. Meanwhile, we’d love to hear from you… write us at PHLtalksclimate@gmail.com or tweet us at @PHLtalksclimate. 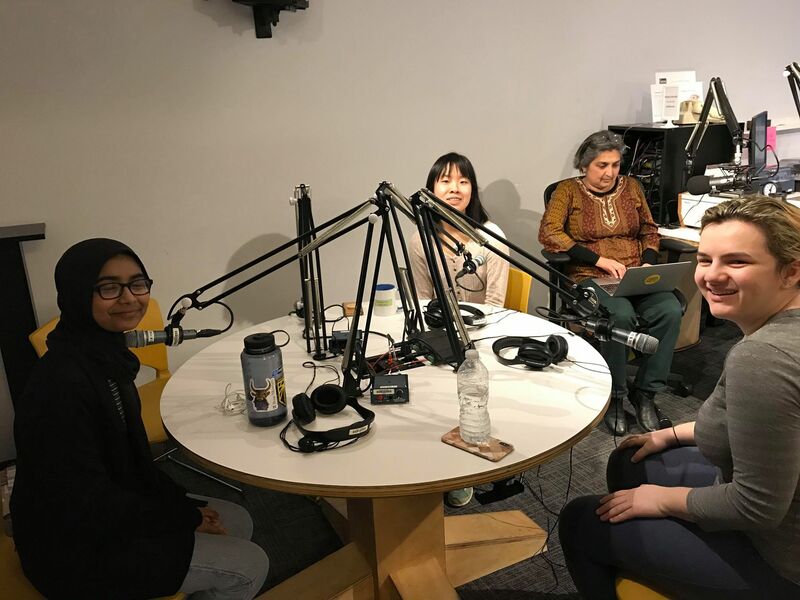 This is Meenal at Philly Talks Climate on WPPM, People Powered Media at PhillyCAM, our local community access media outlet. What are our youth asking for? They are striking to bring attention to the millions of their generation who will most suffer the consequences of increased global temperatures, rising seas, and extreme weather. They strike because we have only 11 years to prevent even worse effects of climate change. The US Youth Climate Strike has a platform, a list of demands for the US Government – Federal, State as well as Local. They ask for: 1 — A Green New Deal, 2 — Declaration of a national climate emergency, 3 — Compulsory education about the climate crisis, 4 — Preservation of our public lands & wildlife, and, 5 — Deem Water as a human right. A Green New Deal. What is it exactly? Most fossil fuel projects, whether they extract, transport or burn fossil fuels affect poor black & brown communities — where the land is cheap and where there are fewer people with money who might complain. A Green New Deal would include an equitable transition for these marginalized communities. For a community whose livelihood depends on extracting, transporting or burning fossil fuels (think of miners, freight rail, pipeline workers, power plant operators, etc), a Green New Deal would provide an equitable transition for fossil-fuel reliant communities. One where workers would be trained for another industry, and more. A Green New Deal would invest in powering our energy needs 100% with renewable energy, by 2030. The technology exists. The only thing stopping us, it seems, is the lack of political will. New fossil fuel projects are counter to this goal, so the Green New Deal also demands a halt to all new fossil fuel infrastructure projects. The Green New Deal would require that government decisions are based on science, with no input or money from the fossil fuel industry. Instead of taking action on the imminent threat of climate change, our leaders play political games. The young people are aware that these games are played by politicians on both sides of the aisle. In the 1930’s, the New Deal helped our declining economy. Now, in 2019, the Green New Deal could help us act on the climate crisis. An national climate emergency – The Climate Strike demands that we declare a National Climate Emergency and focus the next 11 years on climate action. No more stalling. No more delays. The Climate Strike asks for compulsory comprehensive education on climate change for grades K-8. The Climate Strike asks that our public lands and wildlife be preserved. Species are going extinct at rates never seen before. We need to help biodiversity thrive again. The young people striking realize that water is a human right. That it’s imperative to keep our water supplies clean. A local example could translate to — No Fracked Waste Water in the Delaware River. An update from last week, when we asked you to call your council member to oppose PGW’s proposal for an LNG facility. Though City Council’s Committee on Transportation & Public Utilities couldn’t decide on the safety of electric scooters recently, they could very swiftly agree on the safety of this new fossil fuel project. The committee of 7, chaired by Kenyatta Johnson of District 2, OK’d the Passyunk Energy Center. This is a project fast-tracked by Council member at large, Derek Green. The Passyunk Energy Center would liquefy natural gas, which is commonly referred to as LNG. The natural gas is not needed to keep Philadelphians warm since the liquefied gas would be shipped elsewhere; perhaps Boston, perhaps overseas. The committee fast-tracked this despite many questions from the public advocate and much resistance from the public. We showed that 20 groups were against this project, that 18 ward leaders and committee persons were against this project, and that 4 state reps were against this project. We spoke of the need to halt fossil fuel projects. Of the need to reduce our emissions. Of the need to invest the same millions in renewable energy. Natural gas is mostly methane. The Union of Concerned Scientists tells us that methane is worse for the climate than carbon dioxide. How much worse? Methane is about 86 times worse than carbon dioxide in the first 20 years. 86 times worse. Natural gas, because of methane leaks, is worse for the climate than using coal, oil, diesel or gasoline. And yet the committee members voted, believing the industry myth that gas is clean and would reduce our city’s emissions. Last Thursday, March 7th, this project was introduced to the full City Council and could come up for a vote any time. We thought the vote could be as early as tomorrow March 14th. Thanks to all our calls, tweets and emails, the vote has been delayed for now. We still need you to call any and all council members today. Tell them to Pass On Gas, and vote NO for PGW’s LNG project, also known as the Passyunk Energy Center. If you can, please also come to City Hall, Room 400 at 10 am tomorrow, March 14th, to show that you, too, want No New Fossil Fuel projects. For more detail, including a list of phone numbers for each Council member, see phillytalksclimate.wordpress.com. That’s philly talks climate dot wordpress dot com. You’ll find the script for this show, complete with links! Didn’t catch all that? Write us at PHLtalksclimate@gmail.com or tweet us at @PHLtalksclimate. To return to the youth striking for climate… there appear to be 4 School Strikes for Climate in our region. All will be on Friday March 15th. One is at 11 in West Chester. Another is at noon in Villanova. And the two that we’re going to focus on will be in Philly. Join ClimateStrikePA from noon to 12 at Love Park. We expect many middle school students, including a carload from Wilmington Delaware. And again, from 3:30 to 5:30 at City Hall. At this later ClimateStrikePA, we expect many high school and college age students. The School Strikes for Climate in Philly have been organized by Sabirah Mahmud, Julianna Schweitzer and Enya Xiang, here with us today. Sabirah goes to the Academy at Palumbo in South Philly and is a sophomore there. What do you have planned for this Friday? What do your parents have to say about this? When is the School Strike for Climate? You go to different schools. I’m curious, how did you meet? How can we, your elders, help you? See you at the School Strike for Climate this Friday. Come to Love Park at noon. And saunter over to City Hall at 3:30. Can’t make it? Follow them at @ClimateStrikePA. To see what local climate solutions could look like, join Philadelphia Ready for 100, the People’s Emergency Center, and Ants on a Log on Saturday, March 16th from 10:30 till 2pm at The Bank – 3750 Lancaster Avenue in West Philly for a FREE community event focusing on climate and energy issues. Speakers and workshops will be followed by a family-friendly musical by Ants on a Log. Food provided by EAT Cafe. Didn’t get all that? You can find details on the calendar at phillytalksclimate.wordpress.com. This is Meenal Raval at Philly Talks Climate on PhillyCAM, our community access media.